June 1948: he made his first appearance on stage at the Tôkyô Gekijô, receiving the name of Nakamura Mannosuke. July 1953: revival at the Meijiza of Kawatake Shinshichi III's 1878 drama "Tsûzoku Saiyûki"; Mannosuke played the role of Kinkan [casting]. September 1954: his grandfather (and adoptive father) Nakamura Kichiemon I died. January 1961: Mannosuke and his brother Ichikawa Somegorô VI signed exclusive contracts with the Tôhô Company and left the Shôchiku Company, followed in March by Matsumoto Kôshirô VIII, Ichikawa Chûsha VIII and Nakamura Shikaku II. July 1963: revival at the Yomiuri Hall in Tôkyô of Namiki Shôzô I's drama "Kuwanaya Tokuzô Irifune Monogatari"; Mannosuke played the role of Takamaru Kamejirô [casting]. May 1965: Nakamura Mannosuke took the name of Nakamura Kichiemon II at the Imperial Theater, playing the roles of Konoshita Tôkichi and Munesada in the dramas "Kinkakuji" and "Seki no To". December 1966: second month of the opening ceremony of the National Theatre with the full length performance of the classic "Sugawara Denju Tenarai Kagami"; Kichiemon played the role of Umeômaru [casting]. February 1967: premiere at the Kabukiza of Hagiwara Yukio's dance-drama "Dattan"; Kichiemon played the role of a rengyôshû [casting]. September 1970: Kichiemon plays for the first time the role of Kumagai Naozane in the play "Ichi-no-Tani Futaba Gunki" (commonly called "Kumagai Jin'ya"), which was performed at the Imperial Theater. 1972: Kichiemon went back to Shôchiku Company, after the failure of the Tôhô Kabuki project. June 1973: revival at the National Theatre of Tsuruya Nanboku IV and Sakurada Jisuke II drama "Kokoro no Nazo Toketa Iroito"; Kichiemon played the role of Honjô Tsunagorô [casting]. August 1979: revival at the National Theatre Kawatake Shinshichi II's drama "Kanzen Chôaku Nozoki Garakuri"; Kichiemon played the roles of Murai Chôan and the Iseya bantô Kyûhachi [casting]. January 1980: Kichiemon took part in the first Kabuki performances at the Asakusa Kôkaidô [more details]. June ~ July 1990: Kichiemon took part in a Kabuki tour in the USA, performing in 26 shows in several big cities; he played the roles of Narukami and Tamanoi in the plays "Narukami" and "Migawari Zazen" [casting]. Kichiemon plays also the role of Musashibô Benkei in the play "Kanjinchô", which was performed only in Los Angeles. September 1999: Kichiemon plays for the first time the role of the larger-than-life king of thieves Ishikawa Goemon in the rare jidaimono "Zôho Futatsu Domoe", which was staged at the Kabukiza. October 1999: premiere at the Kanamaruza of "Tomoe Gozen", a dance created by Matsu Kanshi II (alias Kichiemon). January 2001: Kichiemon played at the National Theatre the role of Sodehagi, one of the most difficult female roles in the Kabuki repertoire, in the drama "Ôshû Adachi-ga-Hara". Kichiemon successfully overcame this great challenge. April 2001: Kichiemon played for the first time the prestigious and visual role of Taira no Tomomori in the jidaimono "Yoshitsune Senbon Zakura", which was staged at the Kabukiza. October 2001: Kichiemon played for the first time the role of the wicked Motoemon in the drama "Tengajaya-mura", which was staged at the National Theatre. 15 December 2002: Kichiemon joined the prestigious Japan Art Academy (Nihon Geijutsuin). April 2003: Kichiemon played for the first time the role of Watônai in Chikamatsu Monzaemon's masterpiece "Kokusen'ya Gassen", which was staged at the Kabukiza. September 2003: the Kabukiza commemorated the 49th anniversary (50th memorial service) of the death of his grandfather Nakamura Kichiemon I; Kichiemon plays 2 of his adoptive father's favourite roles, Kôchiyama Sôshun in "Kôchiyama" and Shunkan in "Heike Nyogo no Shima". May 2006: Kichiemon played at the Shinbashi Enbujô the roles of Danshichi Kurobê, Ishikawa Goemon and Beniya Chôbê in the dramas "Natsu Matsuri", "Zôho Futatsu Domoe" and "Shôchikubai Yushima no Kakegaku". January 2007: Kichiemon received the 48th Mainichi Performing Arts Awards (2006) and the Special Award of the 6th Asahi Performing Arts Awards (2006). July 2011: Kichiemon received the prestigious title of Living National Treasure (Ningen Kokuhô in Japanese). November 2014: the Annual Festive Face-Showing Grand Kabuki at the Kabukiza commemorated the 32nd anniversary (33rd memorial service) of the passing away of Matsumoto Hakuô I. His two sons, Matsumoto Kôshirô and Kichiemon, were the zagashira [more details]. December 2014: "Igagoe Dôchû Sugoroku" was staged as a tôshi kyôgen (5 acts, 6 scenes), including the rarely-staged "Fujikawa Shinseki" and "Okazaki Yamada Kôbê Sumika" acts (they were staged for the last time more than 44 years ago, in September 1970 at the National Theatre), at the National Theatre with Kichiemon as zagashira; he played the role of Karaki Masaemon [more details]. November 2015: revival at the National Theatre of the drama "Shinrei Yaguchi no Watashi" (tôshi kyôgen in 4 acts); Kichiemon played the role of Yura Hyôgonosuke Nobutada [more details|casting]. March 2017: "Igagoe Dôchû Sugoroku" was staged as a tôshi kyôgen at the National Theatre. The core of this revival was "Okazaki". 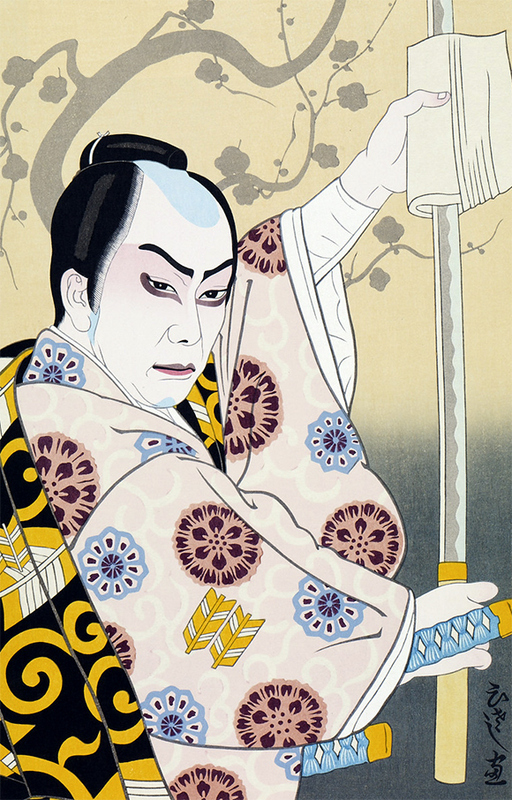 The third act, commonly called "Engakuji", which was staged for the last time in February 1931 at the Meijiza, was revived as well; Kichiemon played the role of Karaki Masaemon [more details | casting]. Living National Treasure Nakamura Kichiemon II is an amazing tachiyaku and one of the most popular contemporary actors. Nakamura Kichiemon II's best roles : Kôchiyama Sôshun ("Kôchiyama"), Kumagai Jirô Naozane ("Kumagai Jin'ya"), the boatman Matsuemon/Higuchi Jirô Kanemitsu ("Hirakana Seisuiki") and Matsuômaru ("Sugawara Denju Tenarai Kagami").